After knowing all about bearing the main important things is proper selection of bearing for any moving vehicles or machines. 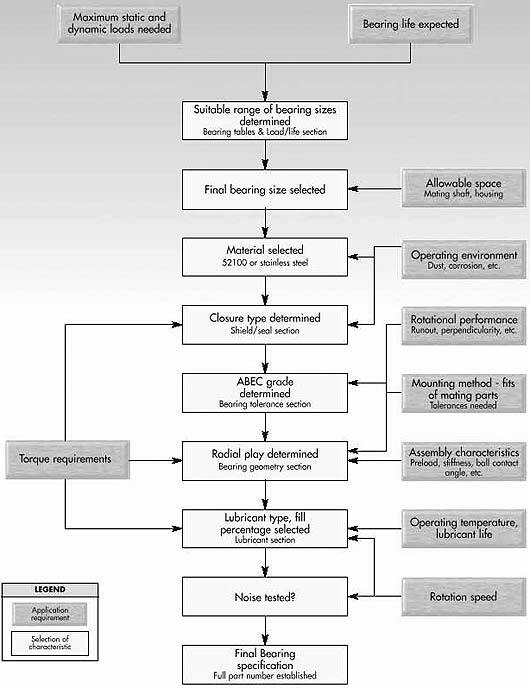 The selection of ball and bearings for a given installation depends upon the following factors. The speed of the shaft in r.p.m. The anticipated life of the bearing. The proportion of thrust to radial load. Generally Ball bearings are suitable for small machines run at high speeds while Roller Bearings are suitable for machines to be placed under heavy loads. Deep Groove Angular contact Ball bearings are suitable where comparatively heavy thrust load is to be carried at high speeds. Self-aligning Ball Bearings and spherical Roller bearings are suitable for such parts as are apt to be subject to permanent bindings or wraps. Cylindrical Roller Bearings are suitable for those shafts which have been allowed to move freely longitudinally within certain limits. Tater Roller Bearings are suitable for arrangement dealing with heavy composite loads as in of automobile parts. Thrust Ball Bearings are suitable for arrangements put under light axial loads.